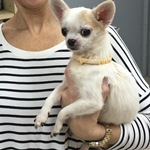 Our mini Chihuahua with those Piranha like teeth is staying put - in his supposed foster home and now to be forever home. He has fit in so well with the other less ferocious little ones and oh does he love his mummy! He sleeps on her shoulder, his head nuzzled in her neck and sleeps soundly into the early hours. We couldn't ask for a more lovely end and new beginning - happy newbie Claudia, and thank you for all you do for the minute dogs who need help like so many others.